The MetaTrader 5 Trading Platform is a perfectly equipped trader's working tool that allows trading on the financial markets. It provides the necessary tools to analyze price dynamics and use the automated trading programs (Expert Advisors). The platform represents the all-in-one concept and combines everything you need to trade in the financial markets. 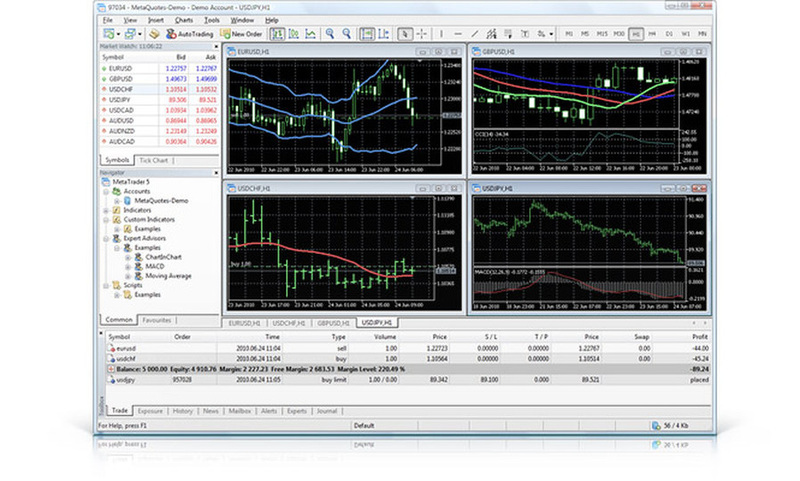 Trading, market analysis and automated trading are integral parts of the forex trading software. It enables traders to work not only with Forex market, but also trade Options, Futures and Stock Markets. ​The MetaTrader 5 forex trading platform offers numerous impressive analytical features: 82 various tools including graphic objects and technical indicators allow traders to analyze stock and currency prices. There are 21 timeframes available for each market security and the possibility to open up to 100 charts at a time. MetaTrader 5 Trading Platform with its rich analytical arsenal is now available to traders. MetaTrader 5 Mobile Trading provides the possibility to manage your trading account from anywhere in the world (Mobile Trading). Having a smartphone or tablet PC, you can keep up with financial information and conduct trade operations in financial markets: Forex, Stocks, Futures and CFD. The rich functionality of the Trading Platform now fits in your hand with MetaTrader 5 Mobile Trading! Mobile trading software MetaTrader 5 is your daily assistant and an indispensable working tool. Stay mobile and trade, keep up with information on financial markets and analyze it – with MetaTrader 5 Mobile Trading Platform you can do it 24 hours a day. You want to open a trading position in the morning while you are in London and then close it in the evening when you reach New York? No problem! With the MetaTrader 5 mobile trading software it could not be easier. Mobile trading with MetaTrader 5 offers you mobility combined with convenience and a rich set of handy trading tools. The MetaTrader 5 Mobile Trading is available on smartphones and tablet PCs based on the popular iOS and Android platforms. You can download a free mobile trading platform for any supported mobile device. Besides, you can download MetaTrader 5 Android in APK format. If you have not found your broker in the MetaTrader 5 Mobile Trading Software list, please ask them to contact us.